Humor Bloggers Fantasy Football League Blog: He Da Man! 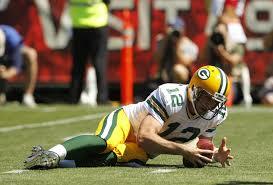 I'm talking about Aaron Rodgers. He and his Packers may have lost to the Giants last week but he racked up 32 fantasy points for my nonames nevertheless, en route to a 119-81 win over newcomer Gerrog's Ninjas. Get up, man, I'm talking about you. It wasn't a good week for any of our newcomers, all of them - and Renal Failure - going down to defeat. The nonames victory was ably assisted by Victor Cruz with 36 points and Reggie Bush in his brand spanking new Detroit uniform - and a busted thumb - with 32 points. David Wilson had a terrible game what with several fumbles and a touchdown off one of them racking up a big minus 1 for the 2012 #1 draft pick. 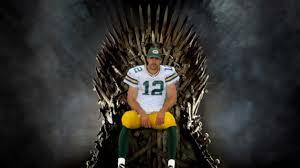 This is the third year I've had Rodgers as my #1 QB. Where did it get me? Certainly not to the playoffs. But this year's gonna be different. I'm gonna cut back on the trash talk and ease up on the put-downs. I'm gonna let my players speak for me. Well, except for David Wilson. Next week we play Purple Drank. He won this week too. Bring it on Mr. Kool-Aid. You're going up against the highest ranked - and paid - QB in the league. Oh, he da man. He da King! I'm glad I didn't Play Troi. He had Payton Manning who garnered 58 points! I got your discount double check right here. *crosses forearms in an "x" shape over his fly*. A subtle dis indeed, Chris.